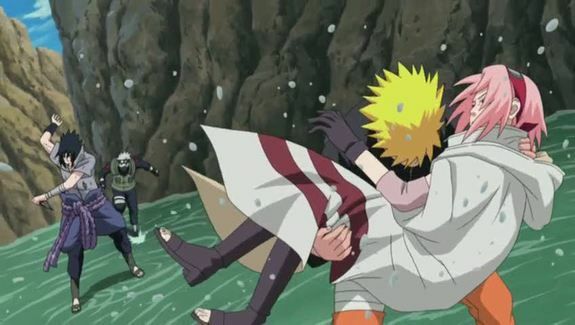 You are going to Watch Naruto Shippuden Episode 214 English dubbed online free episodes with HQ / high quality. Stream Anime Naruto Shippuden Episode 214 Online English dub The Burden. As Kakashi heads towards Sakura, Sasuke tells her that his new ambition is to slaughter the Hidden Leaf. He asks her to prove her loyalty and love by killing Karin. However, Sasuke tries to kill her only to be stopped by Kakashi. The two fight, with Sasuke considerably weakened by his previous fight with Danzo. When she is done healing Karin, Sakura tries to attack Sasuke from behind, but hesitates. Sakura is only saved from certain death when Naruto intercepts Sasuke’s attack.